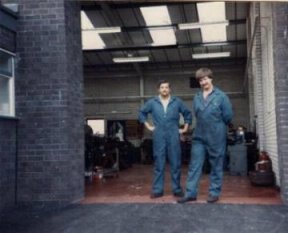 I started the business March 1983 because it was very difficult to find anyone who could offer the trade a fast turn around on machining and supplying quality parts to suit. This was due to the fact that most other reconditioners were all involved in the assembly side. However I decided to sort this problem out by primarily doing just the machining while you undertook the assembly work, which also means that you are selling more of your own labour. I invested heavily in the latest and best machinery available and we still operate the same efficient service today and by all accounts it works very well. For example, Cyl Head Refacing, Pressure testing, Seats & Valves refaced, Valve guide Sleeving, Brake Discs & Drums refaced & much more, normally 1 hour service. Even Cyl Rebores & Crankshaft Grinding are within half a day,This means that you can bring all your engine parts that need attention have them back machined, complete with the all necessary parts needed and be ready to assemble the same day to minimize downtime. This is especially important to the busy garage, commercial vehicle owner, buses and taxis etc. We do undertake assembly work, which is mainly on Cyl Heads especially when the tappets are the shimmed type, normally same day turn around. both Trade & Retail customers are welcome. Copyright © 2019 Dave Rushton (Engines). All Rights Reserved.